48,000 grains, Tanks: 10"x54" each. 60,000 grains, Tanks: 12" x 52" each. 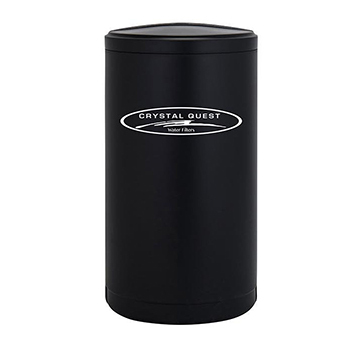 A combination of a Whole House Arsenic Removal and A Water Softener. 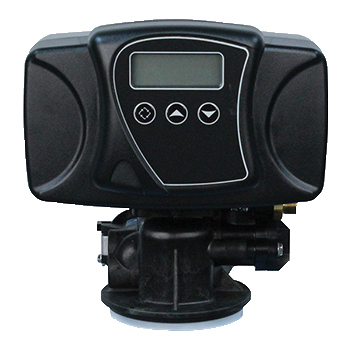 This unit works in situation where arsenic reduction is desired, along with a removal of hardness, scale, calcium and reduction of iron. 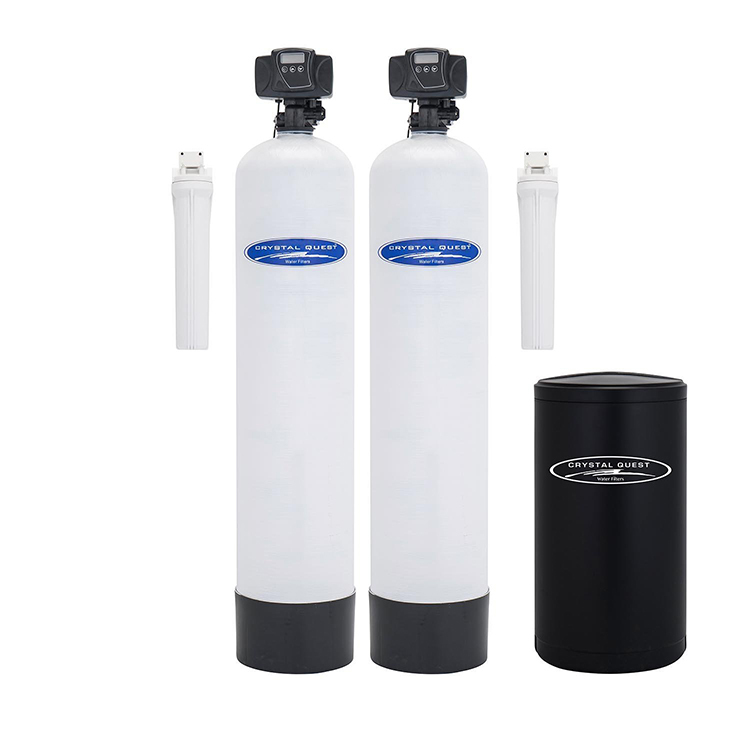 A backwashing system comes in 2 different sizes for smaller or larger homes. An arsenic removal from 50 ppb below 10 ppb (EPA standard), and softer water - great unit for areas whith both of these problems in city or well water! 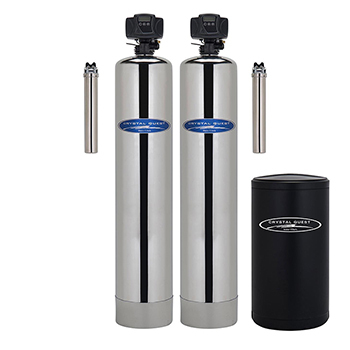 Will remove both types of arsenic, III and V.
Traditional, ion exchage Water Softeners are industry proven technology to remove calcium and reduce hard water. To calculate your system size, test your water to find hardness in grains or PPM - parts per million (divide parts per million by 17.1 to get grains), then divide capacity of the system in grains (48,000 or 60,000) by your hardness level to get gallons of water before a system regeneration will be required. Ideally, you want minimum of 2-3 days before each regeneration. 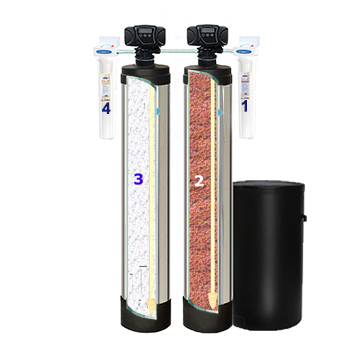 3rd Stage: water travels through a Water Softener tank. 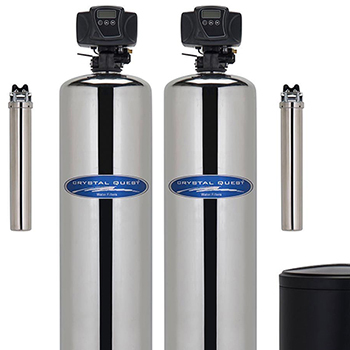 This is our standard ion exchange system that removes hardness, scale, calcium and manganese. It can also reduce iron. Stage 4: water travels through a 20" solid carbon cartridge for a final conditioning of the water and removing any remaining contaminates and VOC's which may be in the water. 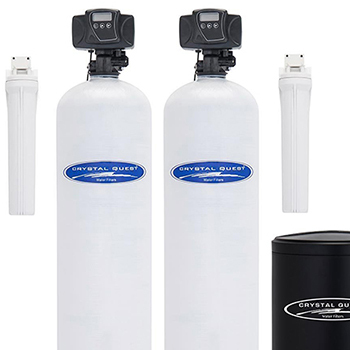 This water purification system has been tested to take aresenic from 50 ppb to below 10 ppb with both arsenic III and V, and sometimes to undetectable (depending on water flow, slower is better). 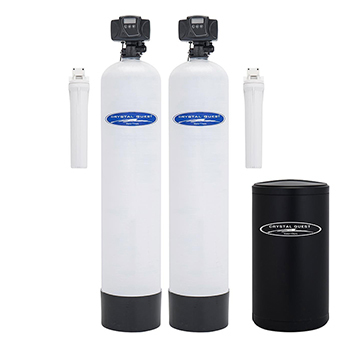 If your arsenic level is higher than 100 ppb, consider two whole house arsenic removal tanks in parallel, or a Commercial Arsenic Removal Water Filter System. Use on cold water only!